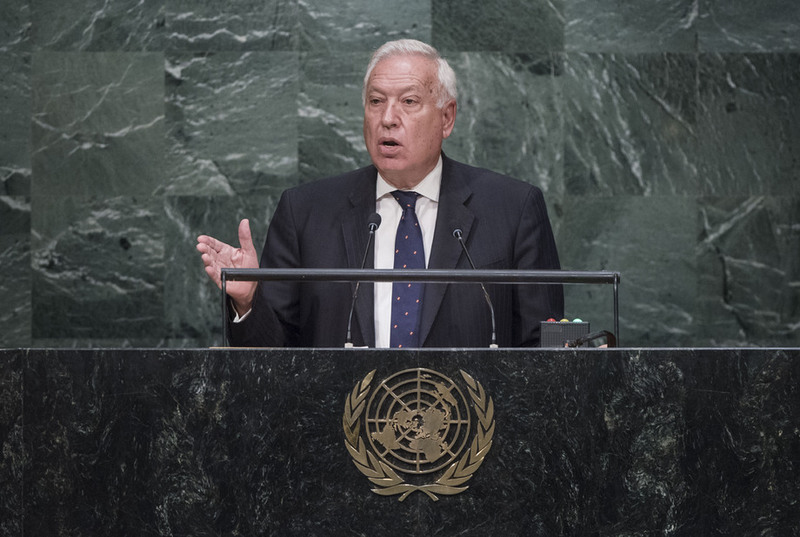 JOSÉ MANUEL GARCÍA MARGALLO, Minister for Foreign Affairs and Cooperation of Spain, said 70 years ago, humanity had awoken from the nightmare of unchecked power. “Law is the reason of States,” he said in that regard; when the reason of law was flouted, nightmares followed. Respect for sovereignty and the territorial integrity of States were integral to the maintenance of international peace and security. There were those that thought the United Nations was weak and unable to respond to the challenges of our times; however, he disagreed. There were encouraging signs, including the recent agreement on Iran’s nuclear programme and the reinstatement of negotiations between the United States and Cuba. On the issue of Gibraltar, the last colony on the European continent, he hoped to engage in dialogue through the United Nations based on the 1984 Brussels Agreement. On climate change, he stressed that “time was running out”. However, there were well-founded hopes that the Climate Conference in Paris could “turn things around”. The world needed a sustainable growth model. Hopes had already turned into reality thanks to the recent adoption of the 2030 Agenda, and commitment had already turned into action through the creation of the Sustainable Development Goal Fund, initiated by Spain but open to all stakeholders. The twenty-first century would be the century of the woman, but equality would not happen by itself. That was why Spain had been promoting equal opportunities for women in all spheres of life. During its presidency of the Security Council in October, Spain would hold an open debate on women, peace and security, and invited all delegations to take part. In its history, Spain had been hit by both internal and international terrorism, he said. Terrorism was born from hatred and disdain for life, and was a crime against humanity. Such evil was manifested in different forms. Today, groups such as Da’esh sought to launch attacks and destroy the present model of civilization. “We must open a common front against Da’esh,” he said, adding that States should not negotiate with terrorists. That was why Spain had joined the coalition of States fighting armed terrorists in the Middle East. Stressing the need to respect the dignity and memories of the victims of terrorism, he said that Spain and Romania had decided to propose the establishment of an International Criminal Court against Terrorism, an international jurisdictional mechanism that would complement the actions of the International Criminal Court and would intervene when a State was not in a position to carry out investigations itself. The images of today’s immense migrant tragedy moved hearts, but the world needed to respond to the issue with reason. A solution was needed that took into account the dignity and rights of migrants. In that regard, he proposed an international covenant on migration. The origin of the migrant crisis was the festering conflicts in places such as Syria, which had a staggering 7.6 million internally displaced persons. Four million Syrian refugees had left the country. The world needed to work on two fronts: provide immediate humanitarian aid and support the inclusive political process presented by the Special Representative of the Secretary-General. On Libya, he called for all parties to come together. The partition of Libya would be the worst possible solution. Finally, on Israel and Palestine, Spain was always willing to support the parties in their return to the negotiating table, and was a proponent of the two-State solution.